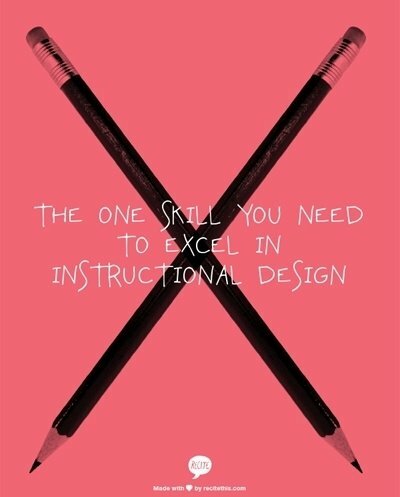 Instructional design is a multi-faceted discipline, and – let’s face it – a lot is asked of instructional designers (IDs). We need to have adult learning theory and learning models at our fingertips, be data detectives, sharp interviewers, and writers who can weave a story, not to mention detail-oriented, process-oriented, organized pros. Yet the one essential skill for IDs in corporate training and Learning and Development (L&D) is rarely taught in schools. As a Solution Architect at SweetRush, I see all kinds of interesting questions come from our clients via RFPs. And trust me, they aren’t softballs – these are direct, challenging questions often requiring research, discussions with my team members, and a fair amount of coffee. So when I was recently asked, “What do you consider the most important aspect of instructional design?” I breathed a sigh of relief. Because, to me, there’s no doubt about the answer to this one. The best instructional designers – the ones who create the most effective solutions, “wow” their clients and their teams, and become the go-to guys and gals for challenging projects – never put pen to paper until they very clearly understand the business drivers for the learning solution. Every training intervention should be directly tied to a goal the organization is trying to meet—whether it is increasing productivity, sales, or customer satisfaction, or reducing errors, theft, or time off the floor or the phone. These goals are tied directly to the client’s bottom line, and in many cases they can be measured, allowing us to gauge the effectiveness of the learning resources we provide. As instructional designers, we need to shift our mindsets from training people because they don’t know something, to training people to improve their performance and impact their business. How do instructional designers work with clients to gather information about business goals? All companies have websites, that’s a given. Public companies will have investor sections with annual reports, quarterly earnings calls, and other information that can be used to glean the corporate goals that are being communicated to shareholders. To the extent that it’s possible to see the business in action, great instructional designers take that extra step. Visiting the client’s retail store, call center, or bank chain puts numbers and goals into context, and may help identify resources and solutions that can further those goals. In addition to asking about the business drivers, gaining an understanding of the client’s values, mission, structure, and culture is essential when approaching a learning solution. Examining the audience’s needs, preferences, and perceptions, allows great instructional designers (and solution architects) to collaborate with clients on a strategy that addresses all of these factors holistically. They understand that nobody knows the business better than their clients. How to Use Business Drivers to Craft Effective Learning SolutionsOnce the business drivers are gathered, how do great instructional designers use them to create effective learning solutions? They link the business objectives to the learning objectives. In this step, instructional designers define specifically what people need to learn during the training. Great instructional designers tie each of those objectives back to a business goal, and state how the learning objective will help achieve the business objective. They translate business drivers into WIIFMs. WIIFMs (or, “What’s In It For Me”) are motivational factors that resonate with employees and get them excited about learning. For example, we currently have a client who wants to boost sales by teaching sales people how to ask customers the right questions, in order to recommend the right products for them. Business drivers for the client: increase sales, increase customer satisfaction. WIIFMs for the employees: how learning a new skill – consultative sales – will help them excel in their jobs, and, even better, serve them for the rest of their careers. By translating the business drivers into WIIFMs, we’ve created a win-win situation. I’ve been fortunate to be in the ever-changing field of instructional design for many years, and I’ve seen learning solutions become more and more sophisticated – e-learning, m-learning, gamification, simulations — the list goes on. This shift places greater demands on instructional designers, with new skills needed all the time. Yet this essential instructional design skill – connecting business drivers to the learning solution – applies no matter if the solution is in the classroom, on a mobile device, or beamed from Mars. Now, on to that next RFP question…Are you getting the best responses to your RFPs? Experiencing process delays? Check out our interactive infographic, Avoid These Common RFP Pitfalls, for our secrets and tips!